As reported information for Windows 8, one of the disadvantages is that it cannot support small screen yet. After Acer Iconia W3 has launched the first 8-inch Windows 8 tablet, it looks like the promise of smaller Windows 8 tablets has been fulfilled. Acer's Iconia W3 has a list price of $380. For that price you get a tablet with an Intel Atom Z2760 Clover Trail processor, 2GB OF RAM, 32GB of storage, and the full Windows 8 operating system, rather than the stripped-down Windows RT software running on some tablets in this price range. Acer W3's choice of the inclusion of a hard Windows button instead of a touch button is praised by users. When using tablets with a touch button, you will accidentally touch it which interrupts your work. This never happens with a physical button like the one on the W3. A microSD slot to expand the memory on the W3--- This slot only handles memory cards up to 32GB unlike most of the competition which handle cards up to 64GB. There is a microUSB jack for attaching peripherals, but it only supports USB 2.0. 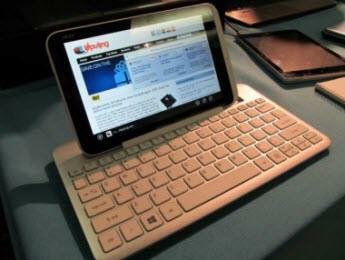 The keyboard is a Bluetooth model that includes a stand for the tablet. The keyboard is powered by 2 AAA batteries instead of a rechargeable scheme as is common for similar products. 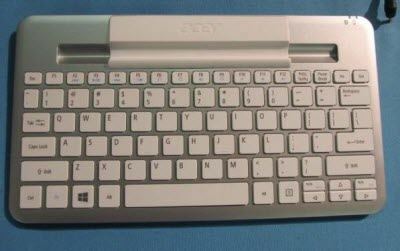 And the bottom of the keyboard has a recessed spot for inserting the Acer Iconia W3 for transport. It is fairly heavy (tablet and keyboard weigh almost two pounds together), which is to provide stability when in use. The W3 display is so small that some controls in legacy apps can be very hard to operate on the touch screen. A trackpad or trackstick solution would be a welcome addition. It would be hard to fit it on the keyboard unit which is already almost too big for comfort. The portfolio case is a simple model that protects the tablet and also serves as a stand. There are two slots for propping the tablet up at two different viewing angles. The case is light, a good thing since the tablet is a bit heavy for an 8.1-inch model. There still some aspects need to be improved. For example, the tablet has a TN display with limited viewing angles, and feels kind of sluggish compared to other Clover Trail tablets. What's important, if you hold the Iconia W3 the wrong way, you'll start to feel like you're looking at a photo negative or a blank screen instead of a tablet. In addition, apart from the problems of the system and accessories, make sure you have solution for other manipulating failure, including forgetting Windows password. 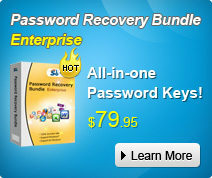 Here comes more information for Acer password recovery. Anyway, the Acer Iconia W3 is a good fit for those wanting a smaller tablet with Windows 8. It is a bit thick and heavy compared to other 8-inch tablets on the market. This seems to be standard for smaller tablets with Intel inside.